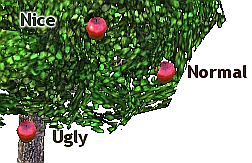 Did you got the opportunity to make 10 bad apples for the culinary career, but have problems to complete it, because your sims have the (extra) green thumb lifetime reward/trait and every plant grows in good quality? Did you think, it is unrealistic, that nearly all fruits from perfect seeds have perfect quality? Think of all the worms, slugs, insects and plant diseases. And even if you manage to get rid of them, it would be unrealistic that all fruits have nearly the same quality. In the game, when you plant a fruit/vegetable, it will be in most cases one quality level higher than the previous plant, or at the same level, but it's nearly impossible, to get a lower quality level. This mod fixes this by changing a few tuning values. - The quality of fruits/vegetables a plant can produce, is now a lot more random than before. It's entirely possible, that a plant of very good quality will produce a few fruits of bad quality. - Harvest will be generally lower quality than before. You will have a high change for a quality decrease, especially if you do not care well for the plants. This mod doesn't make gardening easier or harder in general. Some things will be easier und some things will be harder. For example, because of the higher randomness of the harvest quality, you get a higher change to get single fruits with perfect quality, making the "perfect garden" lifetime wish a little easier to complete. On the other hand, gardening will be more difficult in general because of a smaller general quality increase for the next generation. The opportunity mentioned above will be easier to fullfil, on the other hand, you will harvest in general a lot more produce in bad quality, resulting in lower selling income and worse food. It should be compatible with all other mods, unless they change the same tuning values, the needed skill level/time for the harvest interaction, or the cost multiplier for the different fruit quality levels. It is compatible with Pets (game version 1.26) and all earlier versions. 480 people have said thanks to jonha for this download.